#stampinup #faithfulinkspirations My BFF's daughter has moved to Iowa which is halfway across the country and we miss her so much. But she's following her dreams, so we can't hold that distance against her. She's having a birthday soon and I'm actually going to be on time getting a card to her. IKR?! We should have a national holiday to celebrate that!! I wanted to make a fun, bold card for her and I think I succeeded. What do you think? I started by stamping the big, bold flowers from the "Flower Patch" stamp set onto Whisper White Card Stock. I used Melon Mambo, Pool Party, Island Indigo, Daffodil Delight, and Crushed Curry Inks for the flowers and Pear Pizzazz and Old Olive for the leaves. I cut these elements out with the Flower Fair Framelits. I also cut a piece of Blushing Bride Card Stock for the Melon Mambo flower. I stamped a sentiment and frame from the "Rose Wonder" stamp set in Basic Black Archival Ink and cut it out with one of the Rose Garden Framelits. Next, I adhered a 3-3/4" by 5" piece of black and white striped paper from the Pop of Pink Specialty Series Paper pack to a 3-7/8" by 5-1/8" piece of Melon Mambo Card Stock and then adhered this to a Thick Whisper White Card Stock card base. I tousled a length of Melon Mambo Thick Baker's Twine and adhered that to the card. 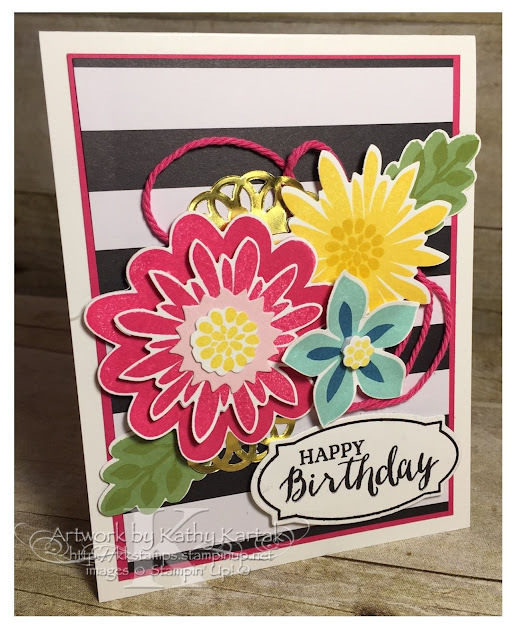 I built the flower layers, using Stampin' Dimensionals and I arranged everything on the card--adhering some elements directly to the card with Snail Adhesive and others to the card with Stampin' Dimensionals. I also adhered the sentiment to the card with Stampin' Dimensionals. For a finishing touch, I cut a small gold Metallic Foil Doily in half and tucked it behind the flowers. The sad news is that the "Flower Patch" stamp set and coordinating Flower Fair Framelits are retiring at the end of May--along with a couple other accessories (in red). The good news is that the Pop of Pink DSP and Melon Mambo Baker's Twine are on sale!! I've update the prices below with the sale prices. Remember that the accessories and tools are only available while supplies last, so be sure to get yours today!